"The question is not, can they reason? Nor, can they talk? But, can they suffer?" - Jeremy Bentham, 19th c. English philosopher and social reformer. In next week's service we will take a gentle, compassionate look into the realities of animals and factory farming with the founders of MARC, Helen and Steve Rayshick. During this service for all ages, adults and children alike will explore the possibility of holding all sentient beings in our circle of compassion. The service will be followed by a vegan coffee hour. All are welcome. On 01 January 1942, the Navy Airship Patrol Group 1 and Air Ship Squadron 12 were established at Lakehurst, N.J. The U.S. Navy was the only military service in the world to use airships--also known as blimps--during the war. The U.S. Navy was actually behind the times in the use of blimps; it didn't get around to ordering its first until 1915, at which time even the U.S. Army was using them. By the close of World War I, the Navy had recognized their value and was using several blimps for patrolling coastlines for enemy submarines. 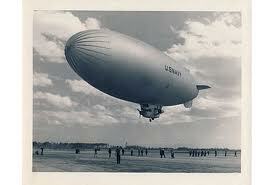 They proved extremely effective; in fact, no convoy supported by blimp surveillance ever lost a ship. Between the wars, it was agreed that the Army would use nonrigid airships to patrol the coasts of the United States, while the Navy would use rigid airships which were aluminum-hulled and kept their shape whether or not they were filled with gas for long-range scouting and fleet support. The Navy ended its construction and employment of the rigid airships in the 1930s after two, the Akron and the Macon, crashed at sea. In 1937, the Army transferred all its remaining non-rigid blimps to the Navy. Meanwhile, in the civilian world, the Hindenburg, a German commercial dirigible, burst into flames over Lakehurst, on 06 May 1937. Thirty-six of the 97 passengers aboard were killed. The explosion was caused by an electric discharge that ignited a hydrogen gas leak; the tragedy effectively ended the use of airships for commercial travel, but they were still used to great advantage in the U.S. military. The late Andrew Randall was a youngster living in the Lakehurst area and would go to the airfield to earn 50 cents to help with the blimp lines! He is in the picture that was taken during the explosion. He served in the United Sates Army, during World War II, married Antoinette Cormier of Bridgewater and raised, his three children, David, Donald and Kathy in Bridgewater. I have fond personal memories of Randy; he was always supportive of all his friends; he was a good and honorable man. At the outbreak of World War II, the Navy had 10 blimps in service; that number expanded to 167 by the end of the war. The only U.S. blimp lost was the K-74, which, on 18 July 1943, spotted a German U-boat. The blimp opened fire on the submarine and damaged it, but only one of its two depth charges released. The submarine fired back and sent the blimp into the sea, but the crew was rescued. The only German blimp involved in the war was a passenger craft, Graf Zeppelin, which was used for electronic surveillance just before the outbreak of the war. 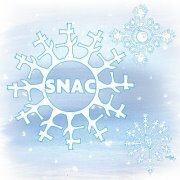 The Southern New England Artist Community (SNAC) will be exhibiting their art in the Bridgewater Public Library’s Flora T. Little Gallery from January 5th through February 24th. The seven artists who will be shown are: Laurel Christie, Matt Tanner, Kat Cope, Charlie Robinson, Corey Ritch, Peter Flood, and Ryan Mehigan. Meet the artists at their Opening Reception in the library’s Flora T. Little Meeting Room on the lower level: Wednesday, January 18, 5:30-7:30 p.m. The gallery is open during regular library hours and is located on the second floor, which is accessible by elevator. The Bridgewater Public Library is open: Monday-Wednesday 9a.m.-8p.m. ; Thursday 9a.m.-6p.m. ; Friday 9a.m.-5p.m. ; Saturday 10a.m.-2p.m. Bridgewater, MA – January 10 – The American Cancer Society Relay For Life of Greater Bridgewater is looking for interested individuals to volunteer their talents on this year’s committee. The next meeting will be on December 10th at 6:15pm, in St. Basil’s Catholic Center on the Bridgewater State College University campus. 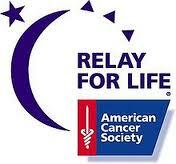 Relay For Life is the signature event of the American Cancer Society. It is a fun-filled, overnight event that mobilizes communities throughout the country to celebrate survivors (anyone who has ever been diagnosed with cancer), remember loved ones, commit to fight back through healthy lifestyle changes, and raise money for the fight against cancer. This year the Relay For Life of Greater Bridgewater will have an Olympic theme! To learn more about Relay For Life, visit www.RelayForLife.org. For information on the January 10 meeting, or if you would like to volunteer on the Relay For Life committee, please contact Monica Querzoli at maquerzoli@comcast.com. The American Cancer Society is dedicated to eliminating cancer as a major health problem by saving lives, diminishing suffering and preventing cancer through research, education, advocacy and service. Founded in 1913 and with national headquarters in Atlanta, the Society has 13 regional Divisions and local offices in 3,400 communities, involving millions of volunteers across the United States. For more information, call 1-800-ACS-2345 or visit www.cancer.org. Have a Real Christmas Tree? Need us to take it away for you? Will come and take away your Tree! We are raising money to replace some of our very old Camping Equipment. Please call or text Dan Moriarty at 508 326-9409 to schedule your Pick Up. 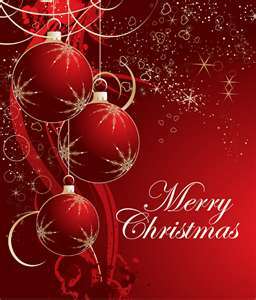 From us at Around the Common, we wish you a very Merry Christmas! The Children’s Room of the Bridgewater Public Library will hold a Lego Club program for children age 6 and older on Saturday, January 14th from10:30-11:30a.m. 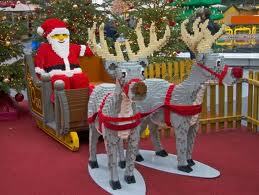 The library will supply the blocks --- children should bring their imagination and creative building skills. All creations will be displayed at the library until the next meeting. Registration is required. To register, drop by the Children’s Room or call 508-697-3331 beginning Saturday, January 7th. With the help of a $7420 grant from the Massachusetts Cultural Council, the Bridgewater Cultural Council recently awarded grants totaling $7210 to 17 individuals, schools and organizations. The Committee received 27 grant applications for programs including music, drama, art, and promotion of literature. · Bridgewater Antiphonal Brass Society, Band Concert 4th of July, $550. · Bridgewater Arts & Music Festival, 4th of July in Bridgewater, $200. · Bridgewater Middle School, Blues for Schools, $650. · Bridgewater Senior Center, Art Program, $600. · Brockton Symphony, Seniors to Orchestra Production, $190. · Fuller Craft Museum, Tour for Seniors, $350. · Gregory Maichack, Painting Workshop, $445. · John Root, Edible Wild Plants of New England lecture, $350. 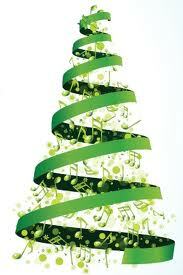 · Jubilate Chorale, Inc., Winter Concert, $500. · The Marble Collection, Literary Magazine for students, $150. · Natural Resources Trust of Easton, Harvest Fair, $300. · Pilgrim Society, Treasure Hunt for children, $100. · Plymouth Philharmonic Orchestra, Concert, $150. · Scott Tooker, Piano Recitals (Ragtime & Romance), $300. “Once again, we are pleased to be able to award these grants and support these excellent programs which are available to Bridgewater citizens”, said Matt Putnam, Bridgewater Cultural Council Chairman. Residents who have experience or an interest in the arts, event planning, fund raising, marketing, record keeping and public relations are urged to apply. Also needed is someone to assume the role of Treasurer next year and volunteers who want to take on leadership roles. Gina Monahan and Kristin Morris (not in photo) of wearyourtown made a donation to the Friends of the Bridgewater Public Library today! Received by Ann Gerald, Curculation Librarian. 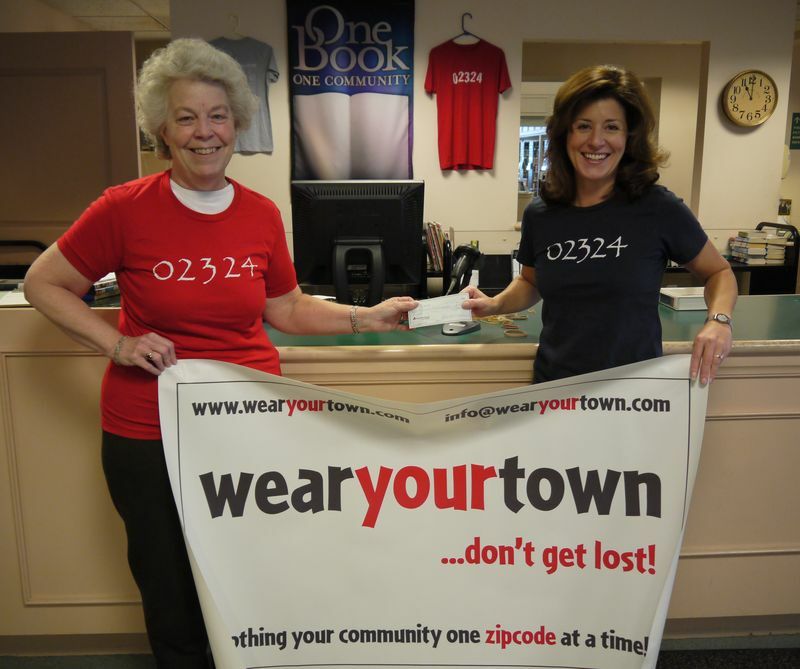 Thanks to all of the Bridgewater citizens who purchased 02324 tees at the library, wearyourtown was able to make a 20% donation of profits from tees sold at this location. The funds will be put towards future Children Events held at the library. We will continue to keep wearyourtown products at the library. As a thank you for their support we will increase our donation to 25% on all library sales! Our public library is such a wonderful resource for children and families. Personally, when my children were not yet school age, we spent a lot of time there! The staff is amazing! They put on fantastic programs for young children. My children and I were regulars at Story Hour and have enjoyed several other special events at the library over the years! wearyourtown is proud to be partnering with the Bridgewater Public Library. We hope we can continue to make donations to the Friends of Bridgewater Public Library. The popular 2012 Boston Masspass books are now available and this is a great way to support the Bridgewater-based Boston Masspass as well as charity. Funds from the sale of the books Around the Common is selling will go to support the Ace Bailey Children's Foundation in support of Bridgewater resident Beth Ann Bligh, who is running the Boston Marathon in support of the charity. You can read more about Beth Ann by clicking here. 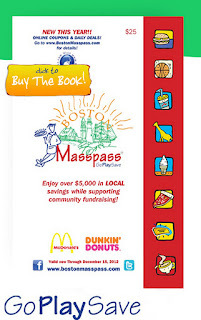 The Masspass books are good at hundreds of different local businesses and are on sale for $25 each. If you are interested in a book, please email aroundthecommon@gmail.com and we would be glad to deliver one to you. The Bridgewater-Raynham Regional High School Annual Holiday Concert will be held in the Bridgewater-Raynham Regional School District Auditorium on Thursday, December 15th at 7PM. Admission is free and there will be raffle prizes and baked goods on sale. The show choir, concert band and 64 person chorus will be performing. 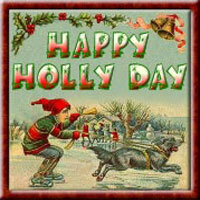 Holiday greens, handcrafted gifts, cheesecakes, Cookie Walk, rummage and book sale, and a visit with Mrs. Claus! Homemade Soup and Bread Luncheon available to warm you up and give you energy to find just the right gift from our local artisans! 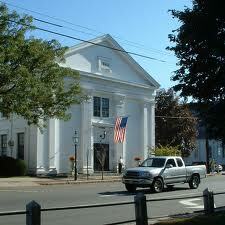 The minutes for the Bridgewater Municipal Building Committee have been posted online. To review them, please click here. Patty and Gina will be giving a workshop at the Bridgewater-Raynham Regional High school. This workshop will take place on Wednesday, December 7th, 2011 and will begin at 7:00 pm. The workshop will be presented in the Lecture Hall (2nd floor) at the BR-High School located at 415 Center St, Bridgewater, MA. This workshop is FREE and open to ALL. Leverage the healing power of laughter. Connect with other imperfect parents. Collaborate with schools to get your children the services they need. Let go of the expectations and learn to love the reality of raising special children. 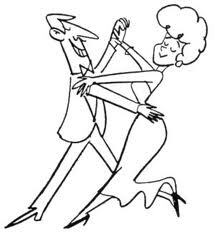 There is still time to sign up for the 10 week, community dance series, featuring instruction in international folk dance, as well as New England square and contra dance. The series begins on Friday, January 6 and will take place every other Friday, from 7:30-9:00 p.m., at the Bridgewater Senior Center, Wally Krueger Way (off Route 18) in Bridgewater. The fee for the 10 week series is $60 per person. For more information or to obtain a registration form, please contact dance leader, Sam Baumgarten, at 508-697-6848, or sbaumgarten@verizon.net. The Bridgewater State University Alumni Chamber Choir, under the direction of Dr. Carol Nicholeris, will present their annual holiday concert on Sunday, December 11, 2011 at 3 PM at the Central Square Congregational Church in Bridgewater center. 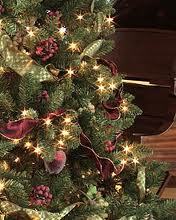 The program, entitled "Welcome Winter," will include new and familiar songs celebrating the season and the holidays. All are invited and welcome to attend.